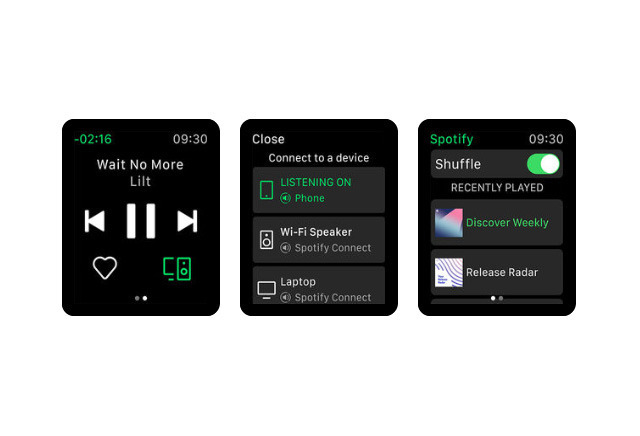 Spotify on Tuesday released a long-awaited native Apple Watch app, albeit missing some key features for now. The app, included with Spotify's latest iPhone update, mainly lets users control music being played on an iPhone or other Spotify Connect devices. This includes browsing playlists, and when the service is streaming, the native app will replace Apple's generic music controls. For quick access Spotify has also included complications, letting people launch with a tap. Users can't however stream music directly to a Watch, which would be handy for LTE models. Additionally there's no option for local caching as on other platforms, which would guarantee music for GPS models and places with poor internet access. Spotify has promised offline listening down the road. The Spotify iPhone app is free to download, and runs on iOS 10 or later. An individual Spotify Premium subscription is normally $9.99 per month.